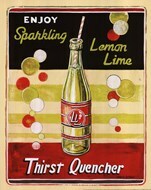 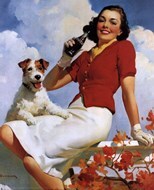 The 1950's brought the modern pop art movement into the United States and, with it, soft drink art. 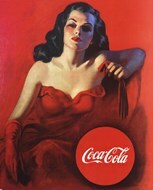 These works originally began as a part of modern artists' concern with commercialism following World War II and have since grown into their own category of modern icon images. 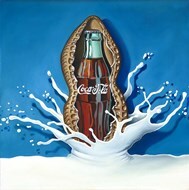 Although the main focus of current soft drink art is to identify the changes that the soft drink industry has gone through, as seen in the work 'Coca-Cola Evolution', many of these works of beverage art still focus on the commercialized aspects of these pop paintings rather than the beverage itself. 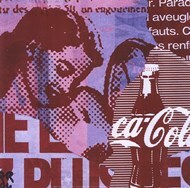 Coca-Cola art is a prime example of this pop art treatment in current times. 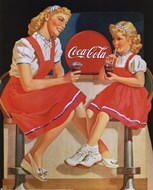 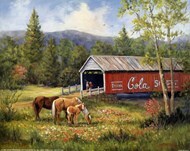 Although mainly vintage in execution, brands such as Coca-Cola are prominently featured in these modern icon prints. 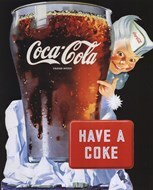 This results in a highly graphic and recognizable work of modern art that brings nostalgia to older audiences and gives younger art audiences a chance to see the rapid evolution of everyday objects in a fast-paced, commercialized world. 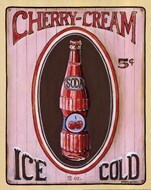 Although, many of the soft drink prints available to consumers today are of commercialized brands, many artists choose instead to focus on a sense of nostalgia in their pop art depictions. 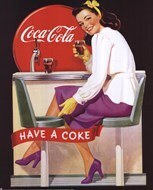 These works, such as 'Cola' by Kate McRostie and 'Malt Shop IV' by Catherine Jones, choose to focus on the differences between today's world and the time when pop art and soft drinks were first becoming well-known. 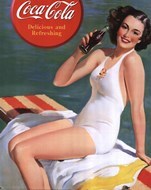 As one of the industries that had the most rapid growth in modern times, soft drink art provides audiences with an intimate view into what the origins of these beverages were.